in Terrace Bay, Ontario, Canada. The flood gates were definitely open today as we passed through the town of Terrace Bay and stopped at Aguasabon Falls. Apparently, the gates of the dam which usually hold the river back further upstream were opened overnight to let the excess water out. This made for quite a spectacle at the Aguasabon Falls - a waterfall which had more than tripled its regular volume of water. 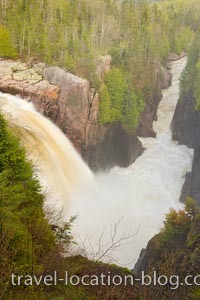 The falls plunge more than 30 metres (100 feet) to the rugged gorge below before continuing its journey to Lake Superior.